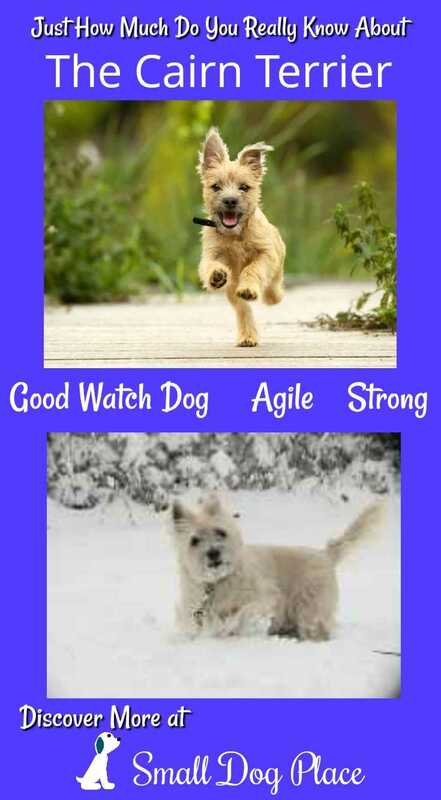 Does The Cairn Terrier Fit Your Life Style? 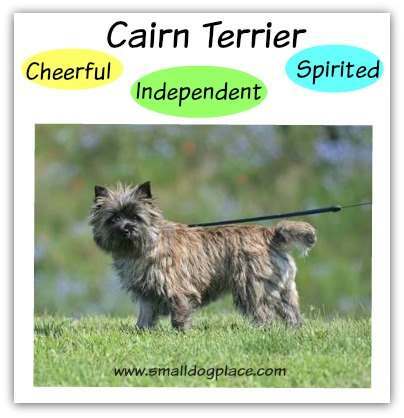 The Cairn terrier is a confident, independent dog full of loyalty to his people, but friendly to all he meets. His adaptability has allowed him to share the home of urban apartment dwellers, rural farm folks and everything in between. First brought to the public’s attention in 1939 with the release of the Wizard of Oz, little Toto charmed children and adults alike. This little dog has strong nails, muscular shoulders, strong jaws, and large feet, all of which can create a dog that is perfect for routing vermin, which of course is why the breed was developed originally. Today, the Cairn terrier participates in Confirmation, Agility, Tracking and terrier trials. With good exercise and training, a Cairn terrier can make a delightful pet for an individual, couple, or family. If you are looking for a warm spirited, independent, happy dog that is great with children, this might be the breed for you. Historically, the Cairn terrier belonged to a group of short-legged terriers, bred on the Scottish Isle of Skye. They were originally used to hunt otter, fox, and badger in the 15th century, and were skilled in jumping at otters from piles of rocks or cairns, found in the Scottish Highlands, thus the origin of their name. These early terriers were bred for their working ability, courage, determination and intelligence. Over time, these terriers began to emerge into distinct breeds. Prior to 1873, the different terriers of Scotland were all grouped together and called Scotch Terriers. Then in 1873, two groups emerged: The Dandie Dinmont Terriers and the Skye Terriers. The Cairn was placed into the Skye terrier grouping along with those dogs that would eventually become the Scottish terrier and the West highland Terrier. The three breeds were mainly differentiated by color, but at that point, a terrier dam could have all three in the same litter. These little terriers were called Short-Haired Skye’s, and were kept to rid farmers of vermin and hunt foxes and otters. 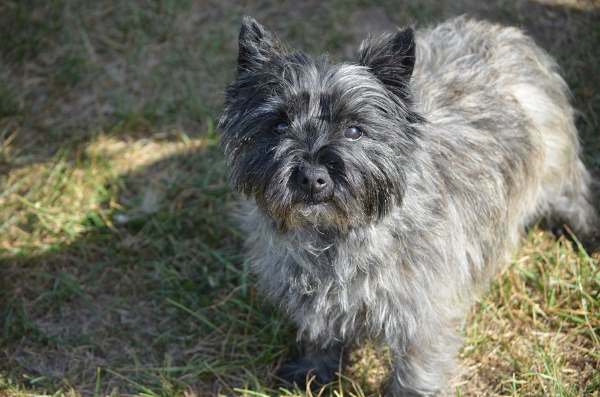 By the early 20th century, they began to be exhibited at dog shows and then in 1912, they were given the name, Cairn terrier and then recognized by the American Kennel Club in 1913. Prior to that date, it was not uncommon for Cairns to be mated with Westies. 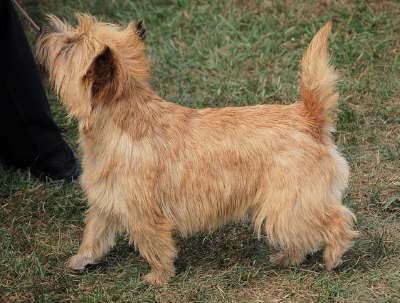 In 2009, the Cairn Terrier ranks 56rd among dog breeds registered by the AKC. By 2014, their popularity had dropped to 67th most popular dog in America. Just think about Toto from the Wizard of Oz, and you will get an immediate feel for this feisty, fearless assertive little dog. Your Cairn may not need to escape from the Wicked Witch of the West, but he’ll have all the tenacity and boldness if the occasion ever arose. ,They are inquisitive, intelligent and a bit mischievous in a fun sort of way. They do love to dig, which is one of those traits that have been bred into them for generations. While not considered problem barkers, they will bark to alert their owner of visitors or even if just bored or lonely. They prefer the company of humans and demand attention and affection. These dogs are very people oriented and super friendly but will defend their territory with courage if need be. if the occasion ever arose. They do well with other dogs, generally, but may not be the perfect pet if there is already a cat in the home. Small rodents such as guinea pigs and hamsters, seem more like vermin to a Cairn than another household pet, so if both live under the same roof, precautions should be taken. Cairn Terriers do well with children who are gentle and know how to treat a dog. They are the perfect size, small enough not to frighten a young child, yet not so delicate that they can’t withstand a little rough and tumble play. They will take long walks, play fetch, or only run at top speeds around the yard or house if you let them. You need not worry about these dogs getting old and sedentary as many have been known to remain energetic and spirited well into their teen years. 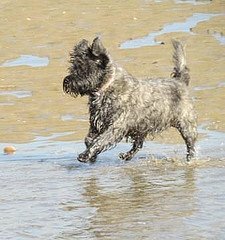 The best type of owners for a Cairn terrier will be one who is willing to train and provide the exercise and stimulation that these dogs crave. Cairn terriers are intelligent and will learn quickly, but might decide to test the limits. Firm, positive approaches work well with these dogs. They do best with owners who are consistent and make it clear who is in charge. Digging can be a problem; so precautions must be made to protect valuable gardens. Walking on a leash is a must. The prey drive is strong in this breed and a stray squirrel might be all it takes for your Cairn to take off to parts unknown. 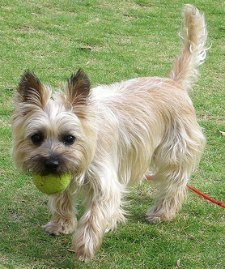 Cairn terriers do best as indoor dogs, but when left to romp and play outdoors, a securely fenced yard is highly advisable. Supervision is important too because with the Cairn’s keen ability to dig; a hole can be created for the great escape in a very short period of time. 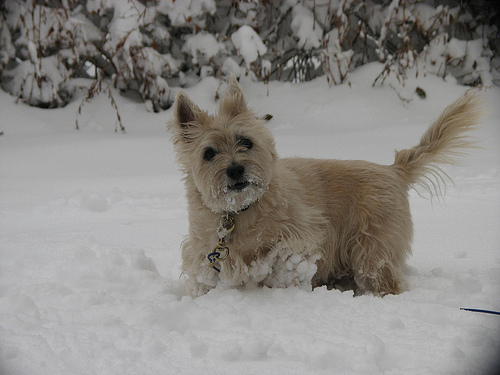 Photo Courtesy of Brad L.
The coat of the Cairn terrier comes in a variety of colors and is weather resistant comprising two layers: a thick harsh outer coat and a soft undercoat. Their wire haired coat keeps the dog dry in rainy weather, and if maintained, the skin can remain healthy, and the outer coat will continue to protect the dog from the elements. They shed very little so, to remove old dead hairs, hand stripping is recommended a couple times a year. Stripping, using a stripping knife or comb removes the dead hair at the roots and allows new hair to grown in. Clipping the coat is not recommended. Brushing and combing the coat is the predominant grooming task and most important one to keeping the coat clean and odor free, keep shedding to a minimum and assuring the dog maintains a healthy skin. Brushing should be done weekly. Bathing is recommended very infrequently as this tends to dry out the coat, cause breakage and actually attract dirt. An alternative to bathing is to place rubbing alcohol in a spray bottle and mist the coat. Next rub the entire coat with a towel and then brush. If the dog is very smelly or dirty and the dirt cannot be brushed out a bath may be in order using a shampoo for harsh coats. No cream rinse is recommended. The Cairn’s nails will need to be trimmed when long and then filed to achieve a smooth surface. Teeth should be brushed regularly and as often is possible. Daily would be ideal but may not be practical for every dog owner. The Cairn’s eyes should be wiped with a soft cotton ball and saline solution to remove any debris or crusty build up from the tear ducts. This is usually done daily. A fine stripping knife is used to groom the ears. Hair on the ears can grow and begin to look shaggy. Removing some of these hairs help the dogs look neater. Pull only the top 1/3 of hair on both sides of each ear. This results in a nice clean appearance that adds to the charm of the Cairn’s already cute face. The inside of the ears will need to be cleaned out periodically using an ear cleaning solution and cotton ball. If you notice redness or a foul odor, it’s time for a vet visit. The Cairn terrier enjoys an average lifespan of 12 to 14 years and is a relatively healthy breed. This sounds like a very long list and might imply that Cairn Terriers are very unhealthy. That is not the case and the chance that your dog could be affected by one of these issues is small. A genetic condition with environmental components that can cause pain, inflammation and lameness in dogs. Click here to read more about Hip Dysplasia in small breed dogs. Craniomandibular Osteopathy, which is also known as lion jaw, is a non-cancerous bone growth which occurs on the lower jaw and long bones of the leg. The symptoms begin around four months of age and often resolve themselves as the puppy reaches his first birthday. They can be as mild as refusing food for a day or two or as severe as pain and the inability to open the mouth. An X-ray will diagnose the problem and treatment usually consists of administering aspirin or steroids. This is an inherited disorder which involves a Single autosomal recessive gene. Krabbe's disease as it is also called is a degenerative disease of the white matter of the brain and spinal cord. If a puppy is born with this condition, he is likely to die very young or will need to be euthanized. It is inherited by a single autosomal recessive gene, but there is a test available now that allows breeders to identify carriers of the disease. Legg-Perthes affects the head of the femur (leg bone) and occurs in many small breed dogs. It is diagnosed by X-ray and surgery can correct the problem.Click here to read more about Legg Calve Perthes Diease. This is a problem in many small breeds of dogs, including the Cairn terrier. In this disease, the knee cap slips out of the groove. It is an inherited disease in most breeds and can be diagnosed by X-ray and a veterinarian palpating the knees. The severity of the condition can vary from very mild to severe requiring corrective surgery. An inherited disease that affects Cairns, the first known cases of this disorder was diagnosed in the United States in 1984. The condition affects both eyes usually with an onset of around 7 to 12 years of age. As the disorder progresses, pigment deposits can be seen in the anterior chambers of the eyes which decrease the eyes’ ability to drain fluid. The fluid accumulates, increasing the pressure in the eye or secondary glaucoma. If untreated, pain and blindness results. If caught early medication can slow the process, but if caught late, the eye may need to be removed. Also known as PRA, this disorder affects a dog's vision at night and then progresses to dim light conditions. Eventually, the dog becomes completely blind. This is an inherited disease. Renal dysplasia is common in many small breed dogs and is an inherited disease described as an abnormal development of the kidney occurring even before the puppy is born. With incomplete kidney tissue, the kidney is not able to function properly and leads to death at an early age. 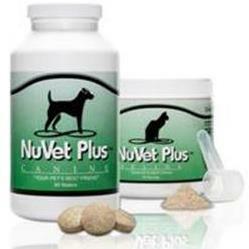 Symptoms include increased urination, increased drinking, vomiting, lethargy, loss of appetite, and weight loss. I always encourage anyone interested in adopting a dog to do as much research as possible before the big day. 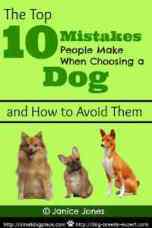 If you think the Cairn Terrier might be the ideal breed for you, consider reading one of the books below.